Winchester Ammo SSH1234 Supreme Hi-Velocity 12 Gauge 3 1-1|4 oz 4 Shot 25 Bx| 10 Cs in. Simply put Supreme High Velocity Steel shotshells are the hardest hitting water resistant steel waterfowl shotshell ever developed by Winchester. Each load features specially formulated propellant to deliver a Full Load Steel Shot charge at 175 fps faster than standard Waterfowl Loads. 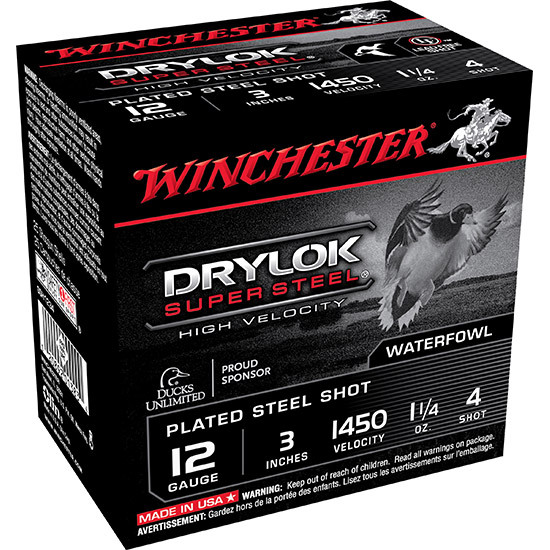 The exclusive water resistant two piece Drylok Super Steel Wad system and plated steel shot offer denser more powerful patterns.